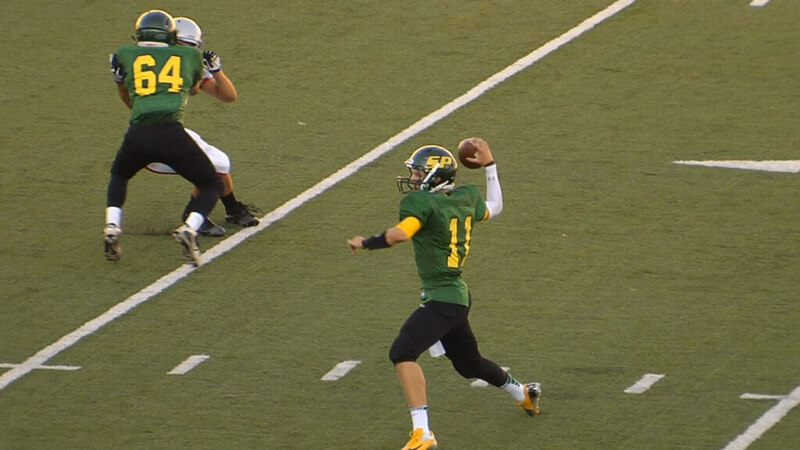 Just barely into his Sophomore season as a Shadle Park Highlander and Brett Rypien (6-2 175) is already breaking GSL passing records. Week 2 against Ferris he completed 29 passes for 459 and broke the single game yards make once held by current Washington State Cougar QB Connor Halliday. A week later against University High School he broke his own record by passing for 480 yards. Rypien started the last 4 games as a Freshman and completed 45 of 95 passes for 690 yards and 8 TDs. So far through 5 games of his Sophomore year he has attempted 237 passes, completing 142 for 1,662 yards and 15 TDs. The name Rypien around Shadle Park is one of legends. 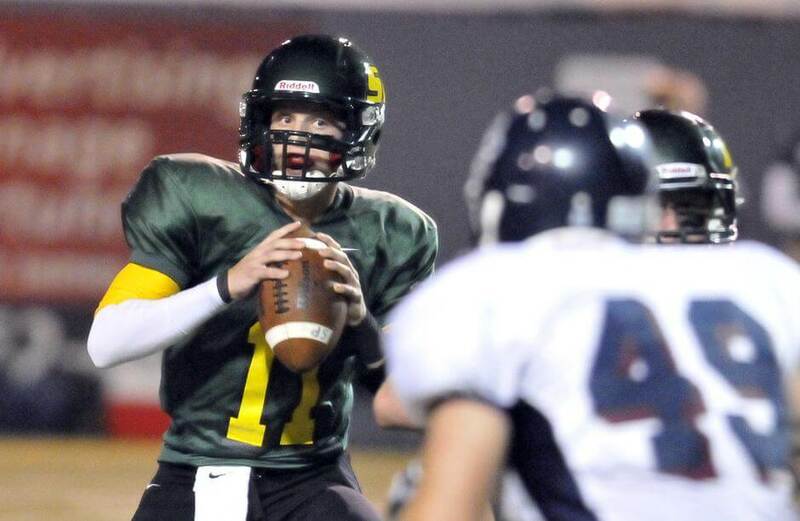 His uncle Mark , also played at Shadle Park, is the GSL’s All-Time Leader in Passing Yards with 4,965. A record that has stood since Mark player from 1978-80. Brett’s dad Tim was drafted in the 2nd round of the 1984 MLB draft by the Toronto Blue Jays. He was a Catcher, Brett is as well, and finished as high as AAA before giving up the sport. Brett is a two sport athlete that could have a future in both football and baseball. I asked Brett if he preferred one over the other. “I’ve wanted to be a QB since the 4th grade,” he said. “I used to walk down here (Joe Albi Stadium) when I was a kid”. Usually your best leaders in baseball are catchers. They see the entire field and are the ones making most of the calls. Same goes for the quarterback in football. Rypien described that to me, “I like the key situations. The clutch moments like 3rd & 12 and I gotta fit the ball into a tight spot”. With four games currently left on the schedule, Rypien only needs 106 more yards to get into the top 10 in the GSL’s Single Season Passing Yards records. First place on that list isn’t all that far away. Connor Halliday again stands on top for the time being with 2,259 yards for Ferris in 2009. Getting 600 yards in 4 games shouldn’t be too much of a problem for Rypien as he is averaging 332.4 yards per game. Catching all those passes from Rypien are four Jr WR’s in Tanner Pauly (5-11 170), Nick Kiourkas (6-3 190), Skyler Kelley (6-0 180) and Alvin Welch (5-5 150). Pauly is considered to be the best all-around receiver of the bunch. 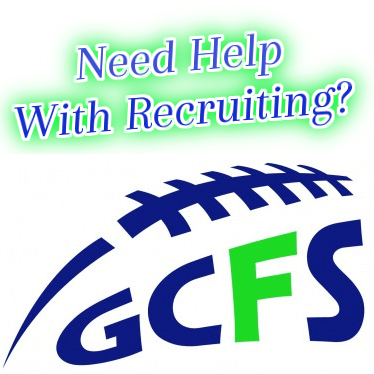 Rypien described him, “He is our best route runner. He always makes a big play when we need one”. Brett is on pace to break his uncle’s career passing record by the end of his Jr year and by the time his career is done they should be absolutely shattered. When asked about that Rypien said with a big smile, “Oh yeah, definite bragging rights”. His love is the game is infectious. Just sitting with him for a few minutes got me excited about his future. I had asked him to send me the latest stats he could find and he had sent them to me before I even left the city limits of Spokane. I can’t wait to watch his progress over the next 2+ years as he makes a run at a record that some probably thought would never be touched.